Jeremy's five suspects for planting the silencer. Re: Jeremy's five suspects for planting the silencer. OK, I have just given my view..
Much like the situation with the grey hair, David Boutflour did not notice the spot of blood on the silencer despite taking a close look at it during the visit to white house farm. Only later that day at Ann Eaton's house. At this stage the grey hair was yet to appear two days later. Ann Eaton tells the court her first impression was that it was that it was rabbit blood. Her explanations for thinking this has several problems. A) Her description of the blood is not consisted with blood that has been exposed for 4 days. Mike do you have another copy of Ann Eaton's trial transcript that does not have some of her answers cut out? There are three answers that have been cut out. Two involving the silencer and another answer involving the buckets in the kitchen. This could be really important info. He or Nevil could have shot rabbits previous to the night of the murders but at that point, perhaps she did believe him - it wouldn't stop him being the killer. But there are copies lying around without the answers cut out. You have posted two copies of David Boutflours testimony, one with the cut outs and one without. I am hoping you might have an untampered version of Ann Eatons testimony also? The one with the cut outs is on a yellowy paper and the other on a brighter white paper. He or Nevil could have shot rabbits previous to the night of the murders. One of the complications of there having been two different silencers / sound moderators, at the heart of this deception, was that insofar as the blood found on the outside of (let's call it) the first silencer, Glynis Howard, had identified that blood as 'human blood', whereas, in April 1986, the same blood from the same area or let us just say in close proximity to the area where Howard had previously identified the blood as human blood, the blood mysteriously became identified as animal blood! Being the inquisitive spirit that I profess to be, the only explanation available, where both human blood and animal blood, could possibly be present in the same silencer (b) and (d), must involve the blood group activity AK1..
Now, irrespective of whether or not, any of you can grasp what I am talking about, with regard to there existing two different identical Parker Hale silencers / moderators, (which was / is true), we end up with one of the four positive blood group results (AK/1) attributed as being unique to Sheila Caffell turning out to be described in the first instance (immediately after 13th August 1985) as ' human blood'. Thereafter, in April 1986 that same blood (AK1) is being described and recorded as being animals blood! Being the diligent philosophical person that I am, had only three blood group results ( A, EAP BA, and HP 2-1) and not the four (A, EAP BA, HP2-1, and AK1) results, been at the heart of the prosecutions case, then (a) the source of the blood group activity could have originated from any one of three victims, (b) Neville Bamber, (c) June Bamber, or (c) Sheila Caffell, or (d) be an intimate mixture, in any mixture, between victims (a), (b) and (c), a far cry from what the prosecution told to the jury by its case..
Rather disturbingly, I feel it is now time to mention, that despite Glynis Howard making a witness statement that she was only involved in the examination of one silencer (SJ/1),22), on the 13th August 1985, suddenly becomes exposed as a deception, because she was involved in the April 1986 re-examination of the other silencer! 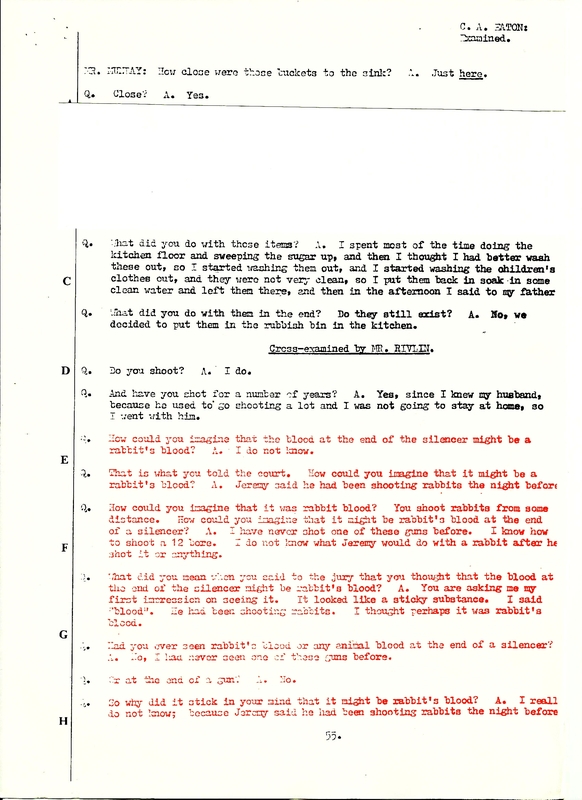 Now, what becomes someone 'alarming' once we grasp this knowledge, is that in August 1985, Glynis Howard told Essex police that it was human blood in the silencer (SJ/1, 22), whereas, she records the presence of animals blood in the same part of the second silencer (DRB/1, 22)? Well, this being the case, how come that by the start of Jeremy's October 1986 Chelmsford Crown Court trial, the experts from the lab' in the form of John Hayward were relying upon four unique blood group results (A, EAP BA, HP2-1, and AK1) unique to Sheila Caffell, when they already knew that one of the four blood group results relied upon, (AK1), should have been discarded by virtue of the fact that the experts could not discern the difference between human or animals blood, as tested by Glynis Howard in August 1985, and much later, by the same expert in April 1986! This deception was enforced because the prosecution sought to rely on the expert evidence given by John Hayward, rather than Glynis Howard - Hayward was only involved in the identifying of the blood from the flake between 12th - 19th September 1985.. But you're still relying on Sheila returning the silencer to the gun cupboard even if the blood is not exclusively hers. The silencer was in the cupboard all night long. It was never returned in the first place. Glynis Howard, examined the first silencer (SJ/1, 22) on 13th August 1985 - concluding that there was human blood in the silencers aperture, on that occasion, but in April 1986, she was involved in the examination of the second silencer (DRB/1, 22), which concluded that blood present in the same part of both silencers SJ/1 (22) and DRB/1 (22) was of animal origin! How, was it possible to detect blood group activity inside the first silencer (SJ/1, 22) at the lab' between 12th - 19th September 1985, if there was no silencer present at all at the Lab' until after this period, had been surpassed? Only one blood group is shared between human and animals, and that is AK1..
Let us not forget, that John Hayward made a huge issue about the relevance of the AK1 blood group result attributed by himself as being present in the solitary silencer argument! Remember how he said that he would have expected to have detected June Bambers AK2-1 in the results, if the blood found in the silencer had been a mixture of the parents bloods? 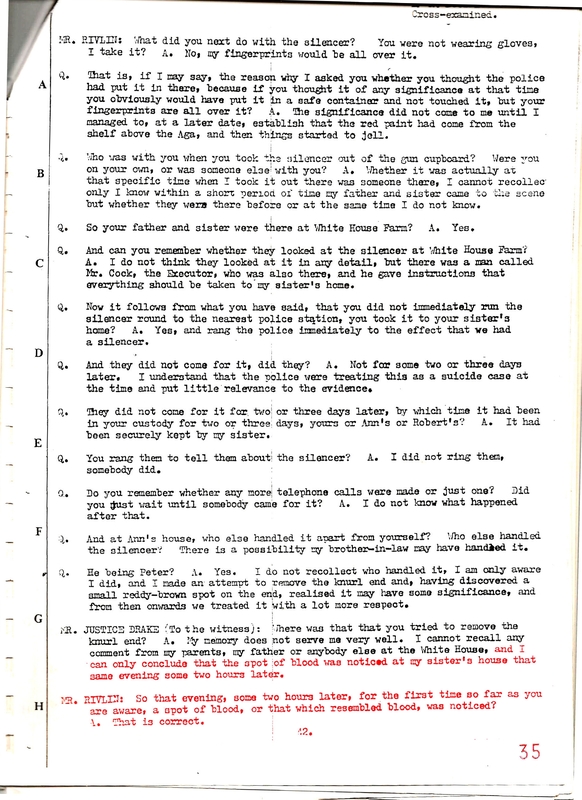 What a lousy thing for him to allege, since by the time of Jeremy's trial in October 1986, Hayward must have known about the work carried out by Glynis Howard in August 1985, and April 1986, and that she had said it was my human blood in 1985, but concluded there was animals blood present in the second silencer she examined in April 1986? 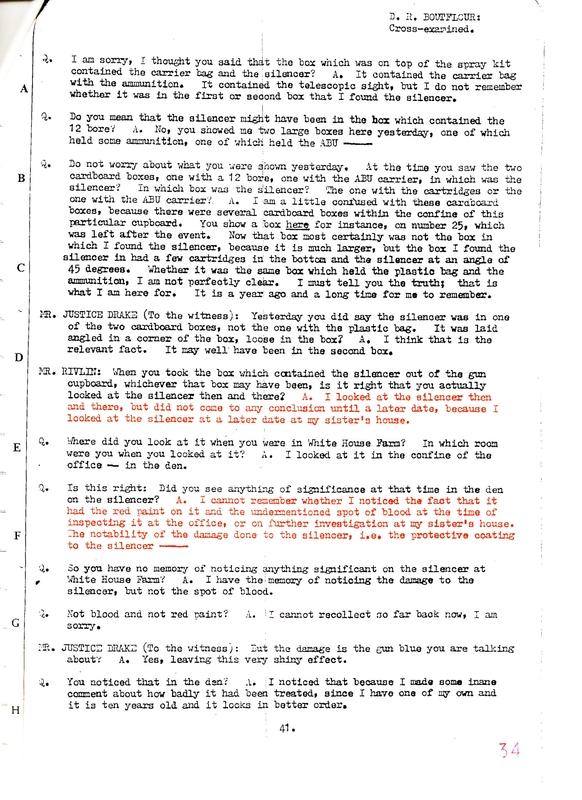 Because of those conflicting results (human versus animal blood - AK1), Hayward had no right to legitimately introduce his argument that the blood group results obtained from inside the silencer was unique to Sheila, and this was the case because of a marked absence of June Bambers AK2-1..